In addition to several larger objects being observed, astronomers began to notice countless smaller bodies also orbiting between Mars and Jupiter. This led to the creation of the term “asteroid”, as well as “Asteroid Belt” once it became clear just how many there were. Since that time, the term has entered common usage and become a mainstay of our astronomical models. In 1800, hoping to resolve the issue created by the Titius-Bode Law, astronomer Baron Franz Xaver von Zach recruited 24 of his fellow astronomers into a club known as the “United Astronomical Society” (sometimes referred to the as “Stellar Police”). At the time, its ranks included famed astronomer William Herschel, who had discovered Uranus and its moons in the 1780’s. Ironically, the first astronomer to make a discovery in this regions was Giuseppe Piazzi – the chair of astronomy at the University of Palermo – who had been asked to join the Society but had not yet received the invitation. On January 1st, 1801, Piazzi observed a tiny object in an orbit with the exact radius predicted by the Titius-Bode law. Ceres (left, Dawn image) compared to Tethys (right, Cassini image) at comparative scale sizes. Credits: NASA/JPL-Caltech/UCLA/MPS/DLR/IDA and NASA/JPL-Caltech/SSI. Comparison by J. Major. Initially he believed it to be a comet, but ongoing observations showed that it had no coma. This led Piazzi to consider that the object he had found – which he named “Ceres” after the Roman goddess of the harvest and patron of Sicily – could in fact be a planet. Fifteen months later, Heinrich Olbers ( a member of the Society) discovered a second object in the same region, which was later named 2 Pallas. In appearance, these objects seemed indistinguishable from stars. Even under the highest telescope magnifications, they did not resolve into discs. However, their rapid movement was indicative of a shared orbit. Hence, William Herschel suggested that they be placed into a separate category called “asteroids” – Greek for “star-like”. By 1807, further investigation revealed two new objects in the region, 3 Juno and 4 Vesta; and by 1845, 5 Astraea was found. Shortly thereafter, new objects were found at an accelerating rate, and by the early 1850s the term “asteroids” gradually came into common use. So too did the term “Asteroid Belt”, though it is unclear who coined that particular term. However, the term “Main Belt” is often used to distinguish it from the Kuiper Belt. One hundred asteroids had been located by mid-1868, and in 1891 the introduction of astrophotography by Max Wolf accelerated the rate of discovery even further. A total of 1,000 asteroids were found by 1921, 10,000 by 1981, and 100,000 by 2000. Modern asteroid survey systems now use automated means to locate new minor planets in ever-increasing quantities. Despite common perceptions, the Asteroid Belt is mostly empty space, with the asteroids spread over a large volume of space. Nevertheless, hundreds of thousands of asteroids are currently known, and the total number ranges in the millions or more. Over 200 asteroids are known to be larger than 100 km in diameter, and a survey in the infrared wavelengths has shown that the asteroid belt has 0.7–1.7 million asteroids with a diameter of 1 km or more. Located between Mars and Jupiter, the belt ranges from 2.2 to 3.2 astronomical units (AU) from the Sun and is 1 AU thick. It’s total mass is estimated to be 2.8×1021 to 3.2×1021 kilograms – which is equivalent to about 4% of the Moon’s mass. The four largest objects – Ceres, 4 Vesta, 2 Pallas, and 10 Hygiea – account for half of the belt’s total mass, with almost one-third accounted for by Ceres alone. The main (or core) population of the asteroid belt is sometimes divided into three zones, which are based on what is known as Kirkwood gaps. Named after Daniel Kirkwood, who announced in 1866 the discovery of gaps in the distance of asteroids, these describe the dimensions of an asteroid’s orbit based on its semi-major axis. Zone I lies between the 4:1 resonance and 3:1 resonance Kirkwood gaps, which are 2.06 and 2.5 AU from the Sun respectively. Zone II continues from the end of Zone I out to the 5:2 resonance gap, which is 2.82 AU from the Sun. Zone III extends from the outer edge of Zone II to the 2:1 resonance gap at 3.28 AU. The asteroid belt may also be divided into the inner and outer belts, with the inner belt formed by asteroids orbiting nearer to Mars than the 3:1 Kirkwood gap (2.5 AU), and the outer belt formed by those asteroids closer to Jupiter’s orbit. The asteroids that have a radius of 2.06 AU from the Sun can be considered the inner boundary of the asteroid belt. Perturbations by Jupiter send bodies straying there into unstable orbits. Most bodies formed inside the radius of this gap were swept up by Mars (which has an aphelion at 1.67 AU) or ejected by its gravitational perturbations in the early history of the Solar System. The temperature of the Asteroid Belt varies with the distance from the Sun. For dust particles within the belt, typical temperatures range from 200 K (-73 °C) at 2.2 AU down to 165 K (-108 °C) at 3.2 AU. However, due to rotation, the surface temperature of an asteroid can vary considerably as the sides are alternately exposed to solar radiation and then to the stellar background. Most asteroids are composed of rock, but a small portion of them contain metals such as iron and nickel. The remaining asteroids are made up of a mix of these, along with carbon-rich materials. Some of the more distant asteroids tend to contain more ices and volatiles, which includes water ice. The Belt consists primarily of three categories of asteroids: C-type, or carbonaceous asteroids; S-type, or silicate asteroids; and M-type, or metallic asteroids. Carbonaceous asteroids are carbon-rich, dominate the belt’s outer regions, and comprise over 75% of the visible asteroids. Their surface composition is similar to that of carbonaceous chondrite meteorites, and their spectra matches the primordial composition of the early Solar System. S-type (silicate-rich) asteroids are more common toward the inner region of the belt, within 2.5 AU of the Sun. These are typically composed of silicates and some metals, but not a significant amount of carbonaceous compounds. This indicates that their materials have been modified significantly over time, most likely through melting and reformation. M-type (metal-rich) asteroids form about 10% of the total population, and are composed of iron-nickel and some silicate compounds. Some are believed to have originated from the metallic cores of differentiated asteroids, which were then fragmented from collisions. Within the asteroid belt, the distribution of these types of asteroids peaks at a semi-major axis of about 2.7 AU from the Sun. There’s also the mysterious and relatively rare V-type (or basaltic) asteroids. This group takes their name from the fact that until 2001, most basaltic bodies in the Asteroid Belt were believed to have originated from the asteroid Vesta. However, the discovery of basaltic asteroids with different chemical compositions suggests a different origin. Current theories of asteroid formation predict that the V-type asteroids should be more plentiful, but 99% of those predicted appear to be missing. Approximately one-third of the asteroids in the asteroid belt are members of an asteroid family. These are based on similarities in orbital elements – such as semi-major axis, eccentricity, orbital inclinations, and similar spectral features, all of which indicate a common origin. Most likely, this is believed to have involve collisions between larger objects (with a mean radius of ~10 km) that then broke up into smaller bodies. Some of the most prominent families in the asteroid belt are the Flora, Eunoma, Koronis, Eos, and Themis families. The Flora family, one of the largest with more than 800 known members, may have formed from a collision less than a billion years ago. Located within the inner region of the Belt, this family is made up of S-type asteroids and accounts for roughly 4-5% of all Belt objects. The Eunomia family is another large grouping of S-type asteroids, which takes its name from the Greek goddess Eunomia (goddess of law and good order). It is the most prominent family in the intermediate asteroid belt, and accounts for 5% of all asteroids. The Koronis family consists of 300 known asteroids which are thought to have been formed at least billion years ago by a collision. The largest known, 208 Lacrimosa, is about 41 km (25 mi) in diameter, while an additional 20 more have been found that are larger than 25 km in diameter. The Eos (or Eoan) family is a prominent family of asteroids that orbit the Sun at distance of 2.96 – 3.03 AUs, and are believed to have formed from a collision 1-2 billion years ago. It consists of 4,400 known members that resemble the S-type asteroid category. 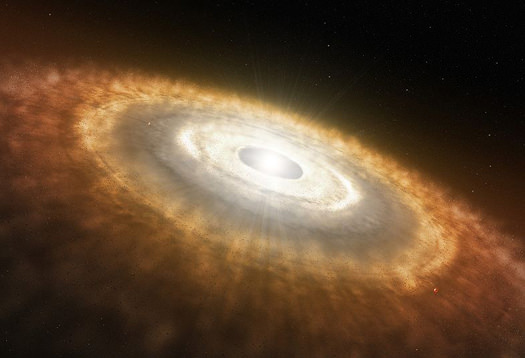 However, examination of Eos and other family members in the infrared show some differences with the S-type, thus why they have their own category (K-type asteroids). The Themis asteroid family is found in the outer portion of the asteroid belt, at a mean distance of 3.13 AU from the Sun. This core group includes the asteroid 24 Themis (for which it is named), and is one of the more populous asteroid families. It is made up of C-type asteroids with a composition believed to be similar to that of carbonaceous chondrites, and consists of a well-defined core of larger asteroids and a surrounding region of smaller ones. The largest asteroid to be a true member of a family is 4 Vesta. The Vesta family is believed to have formed as the result of a crater-forming impact on Vesta. Likewise, the HED meteorites may also have originated from Vesta as a result of this collision. Along with the asteroid bodies, the asteroid belt also contains bands of dust with particle radii of up to a few hundred micrometres. This fine material is produced, at least in part, from collisions between asteroids, and by the impact of micrometeorites upon the asteroids. Three prominent bands of dust have been found within the asteroid belt – which have similar orbital inclinations as the Eos, Koronis, and Themis asteroid families – and so are possibly associated with those groupings. Originally, the Asteroid Belt was thought to be the remnants of a much larger planet that occupied the region between the orbits of Mars and Jupiter. This theory was originally suggested by Heinrich Olbders to William Herschel as a possible explanation for the existence of Ceres and Pallas. However, this hypothesis has since fallen out of favor for a number of reasons. First, there is the amount of energy it would have required to destroy a planet, which would have been staggering. Second, there is the fact that the entire mass of the Belt is only 4% that of the Moon. Third, the significant chemical differences between the asteroids do not point towards them having been once part of a single planet. Today, the scientific consensus is that, rather than fragmenting from a progenitor planet, the asteroids are remnants from the early Solar System that never formed a planet at all. During the first few million years of the Solar System’s history, when gravitational accretion led to the formation of the planets, clumps of matter in an accretion disc coalesced to form planetesimals. These in turn came together to form planets. However, within the region of the Asteroid Belt, planestesimals were too strongly perturbed by Jupiter’s gravity to form a planet. These objects would therefore continue to orbit the Sun as before, occasionally colliding and producing smaller fragments and dust. During the early history of the Solar System, the asteroids also melted to some degree, allowing elements within them to be partially or completely differentiated by mass. However, this period would have been necessarily brief due to their relatively small size, and likely ended about 4.5 billion years ago, in the first tens of millions of years of the Solar System’s formation. The asteroid belt is so thinly populated that several unmanned spacecraft have been able to move through it; either as part of a long-range mission to the outer Solar System, or (in recent years) as a mission to study larger Asteroid Belt objects. In fact, due to the low density of materials within the Belt, the odds of a probe running into an asteroid are now estimated at less than one in a billion. The first spacecraft to make a journey through the asteroid belt was the Pioneer 10 spacecraft, which entered the region on July 16th, 1972. As part of a mission to Jupiter, the craft successfully navigated through the Belt and conducted a flybys of Jupiter (which culminated in December of 1973) before becoming the first spacecraft to achieve escape velocity from the Solar System. At the time, there were concerns that the debris would pose a hazard to the Pioneer 10 space probe. But since that mission, 11 additional spacecraft passed through the Asteroid Belt without incident. These included Pioneer 11, Voyager 1 and 2, Ulysses, Galileo, NEAR, Cassini, Stardust, New Horizons, the ESA’s Rosetta, and most recently, the Dawn spacecraft. For the most part, these missions were part of missions to the outer Solar System, where opportunities to photograph and study asteroids were brief. Only the Dawn, NEAR and JAXA’s Hayabusa missions have studied asteroids for a protracted period in orbit and at the surface. Dawn explored Vesta from July 2011 to September 2012, and is currently orbiting Ceres (and sending back many interesting pictures of its surface features). And someday, if all goes well, humanity might even be in a position to begin mining the asteroid belt for resources – such as precious metals, minerals, and volatiles. These resources could mined be from an asteroid and then used in space of in-situ utilization (i.e. turning them into construction materials and rocket propellant), or brought back to Earth. It is even possible that humanity might one day colonize larger asteroids and establish outposts throughout the Belt. In the meantime, there’s still plenty of exploring left to do, and quite possibly millions more objects out there to study.